Slaithwaite and District Angling Club aquired the lease to this water in February 2010. 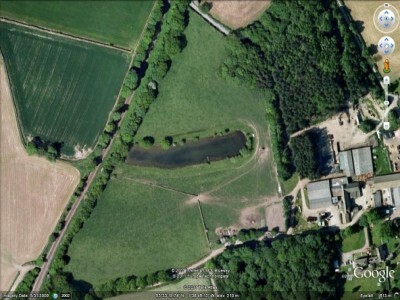 Access to this water is off Gunthwaite Lane, Upper Denby. Day tickets are now available for this water. The pond contains Roach, Perch, Pike, Bream, Carp and Tench. There are some bait restrictions on this water. These are displayed on the notice boards at the fishery. DIRECTIONS From Huddersfield Take the A629 towards Penistone. Continue past the Soverign Public House. Pass through Birds Edge village. Approximately one mile past the village turn left on Denby Lane. Follow the lane and at the T Junction turn left. At the telephone box turn right into Gunthwaite Lane. Follow the lane over the railway bridge, just passed here, at a sharp left hand bend you will see the entrance to the fishery on your right. Please park in the small car park provided, go through the gate and follow the path to the pond, please make sure that you close and fasten the gates behind you. Thankyou POSTCODE (approx) HD8 8YJ This water can get extremely weedy in the summer but with a little swim preparation and the use of appropriate tackle some good tench and carp sport can be had.